Congratulations to winners of Festival 2012 dragon boat races! 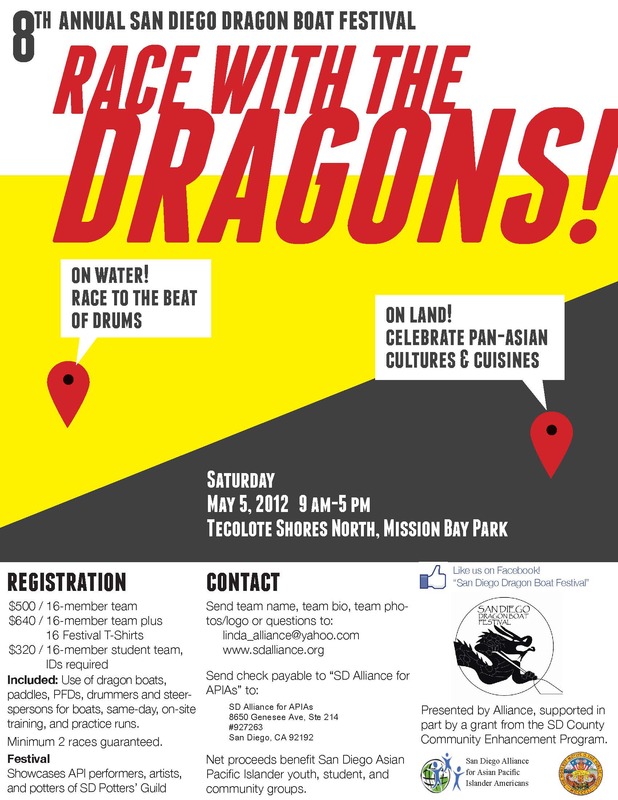 The San Diego Alliance for Asian Pacific Islander Americans is happy to hold its 8th annual San Diego Dragon Boat Festival on Saturday, May 5th, 2012, from 9 am to 5 pm, at Tecolote Shores North (south of the Hilton) in Mission Bay Park. On water, race to the beat of drums. On land, celebrate pan-Asian cultures and cuisines. Come once again and celebrate with us! Sign up for Festival 2012! Form your dragon boat team to race with the dragons! 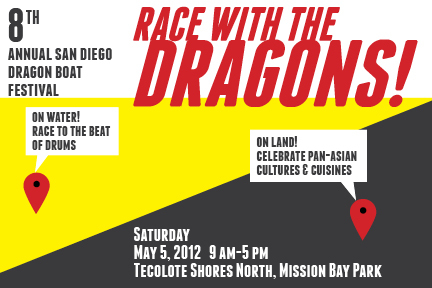 Registration fee for team of 16-paddlers includes same-day on-site training by the renowned San Diego Dragon Boat Team, day-of-Festival use of dragon boats, paddles, PFDs, drummers & steerspersons for dragon boats, pre-race practice runs. Send team name, team bio, and team photo and/or logo by April 21, 2012 to linda_alliance@yahoo.com. Roster of dragon boat teams will appear on Festival T-shirt; team photos and/or logos, & team bios will be published in Festival program book. Registration fee is $500/ 16-member team, $640/ 16-member team with 16 Festival T-shirts. Registration fee for all-student teams is $320/ 16-member team, IDs required. Registration fees are due with registration forms by April 21, 2012. Checks are to be made out to "SD Alliance for APIAs", and sent to: SD Alliance for APIAs, 8650 Genesee Ave, Ste 214, # 927263, San Diego, CA 92192 . The San Diego Dragon Boat Festival is supported in part by a grant to the Alliance from the San Diego County Community Enhancement Program. Our deepest gratitude to San Diego County Supervisors Greg Cox, District 1, and Ron Roberts, District 4. The Alliance gratefully acknowledges QUALCOMM Incorporated for its generous support of the Alliance for our San Diego Dragon Boat Festival.